(November 26, 2013)- A suspect from a January robbery plead to 2 counts of Robbery and 1 count of Criminal Mischief Greater than $1000 and 1 count of Robbery and 1 count of Possession of Firearm By Convicted Felon. 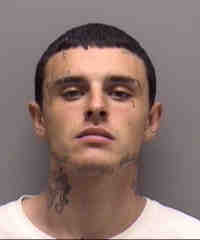 Robert Raymond McDougall, W/M, DOB: 02-11-1991 of 227 SE 29th St Cape Coral FL 333993 was arrested by the Cape Coral Police Department for robbing the Hess station at 1020 Santa Barbara Boulevard S. at gunpoint on January 15, 2013. 15 years minimum mandatory for the Robbery counts. 3 year minimum mandatory for Possession of Firearm By Convicted Felon. The original news release is linked after the break.